Suspended from sugary-hued walls, Tristan Pigott’s new paintings infiltrate the gallery space not unlike the pervasion of screens into our everyday lives. Over-saturating the viewer with loaded colours and visual symbolism, the only thing separating us from feeling we’ve been immersed into the painted alternative of a digital experience could be the prolonged interaction the complexity of these works begs from us. 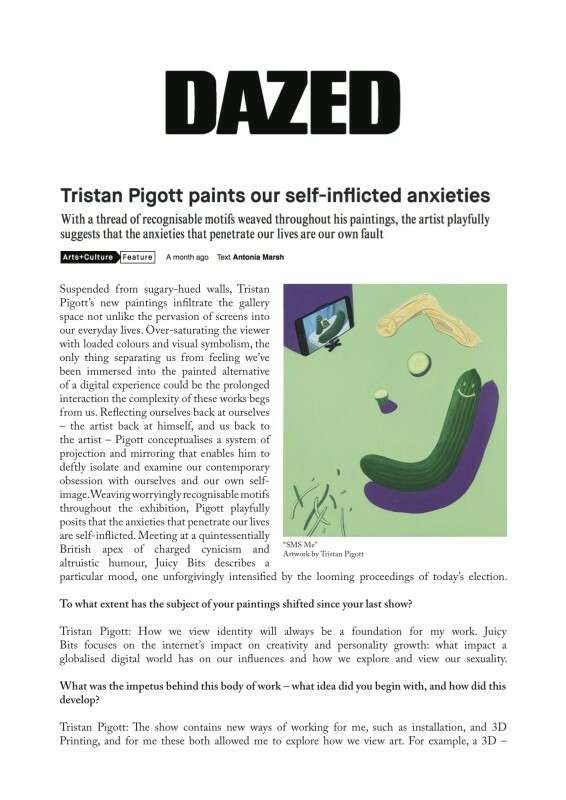 Reflecting ourselves back at ourselves – the artist back at himself, and us back to the artist – Pigott conceptualises a system of projection and mirroring that enables him to deftly isolate and examine our contemporary obsession with ourselves and our own self-image. Weaving worryingly recognisable motifs throughout the exhibition, Pigott playfully posits that the anxieties that penetrate our lives are self-inflicted. Meeting at a quintessentially British apex of charged cynicism and altruistic humour, Juicy Bits describes a particular mood, one unforgivingly intensified by the looming proceedings of today’s election.